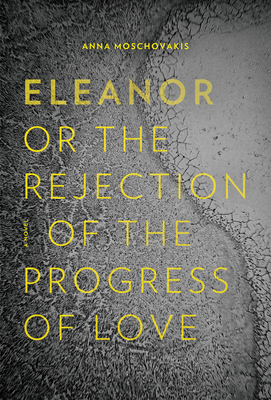 Poet Anna Moschovakis' debut novel, ELEANOR OR THE REJECTION OF THE PROGRESS OF LOVE, is an enthralling story (or two stories) of what it's like to be alive now. I can't think of a book I've read that captures the modern feeling of diconnect, overstimulation, information overload and the desire to authentically feel, like this novel. There's a stolen laptop, an endeavor to retrieve the laptop, a digression into communal life as well as the story of the person attempting to write this story and her relationship with a grumbling critic. Deeply moving, authentic, rich with feeling and bursting with intelligence, ELEANOR will astound you. A missing laptop, a petulant critic, a sojourn in communal living--Eleanor, or, The Rejection of the Progress of Love is a bracingly intelligent examination of grief, autonomy, aging, desire, information overload, and the condition of being a thinking and feeling inhabitant of an often unthinkable, numbing world. Anna Moschovakis's debut novel bristles with honesty, humor, and the hungers that propel us to revise and again revise our lives. Anna Moschovakis's books include They and We Will Get into Trouble for This, You and Three Others Are Approaching a Lake (winner of the James Laughlin Award), and English translations of Albert Cossery's The Jokers, Annie Ernaux's The Possession, and Bresson on Bresson. She is a longtime member of the Brooklyn-based publishing collective Ugly Duckling Presse and cofounder of Bushel, a collectively run art and community space in the Catskills. This is her first novel.